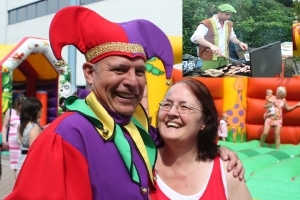 The Court Jester brought loads of fun and laughter to the fifth themed family barbecue to be held by Swindon-based Metric Parking. Sales Executive Martin Channing, in the guise of Metric’s Jester, entertained 65 children whose parents work for Metric in one capacity or another. A total of 160 employees, families and guests attended the popular event which has become an annual date in the Metric diary. This year the theme was medieval and members of the sales team dressed up as King Arthur, Robin Hood, Knights of the Round Table, Princes and Town Folk. There were various children’s races and games as well as a bouncy castle set up in the grounds of Metric House in Swindon. There were prizes, including best costume and for the winning team in the many children’s games sports. Organised by the Metric Sales Department, it was the firm’s way of saying a big ‘thank you’ to existing employees and retired staff. One of the latter was Linda Carter, who worked in Metric’s Service Division for eighteen years before her retirement, and is photographed with the Jester. "It was an absolutely great day," added Martin.